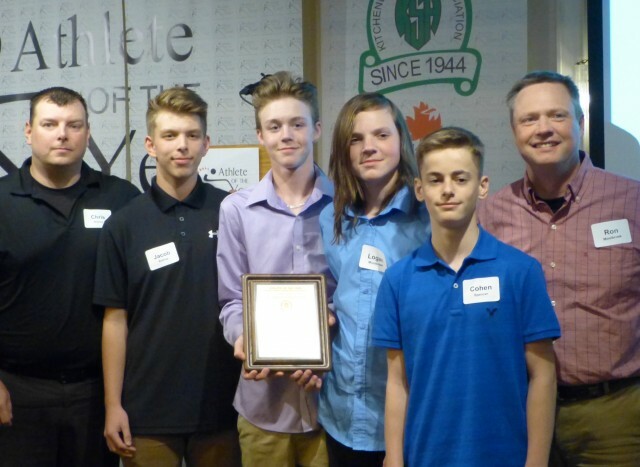 Photo: Some of the players from KMBA's 2016 minor bantam Tier-1 team are shown with their award at the KSA's Athlete of the Year Dinner held May 16, 2017 at Golf's Steakhouse. Congratulations boys, your community involvement and "give back" is appreciated by everyone. Well done! From 1991 thru 2007 Bruce was a member of the Waterloo Minor Fastball Association as a coach, executive member and president. His involvement included hosting provincial and national fastball tournaments. He was instrumental in the merger of the Kitchener and Waterloo minor boys' softball associations in 2007. Bruce has served as convenor, executive member and since 2008 as President of the North Waterloo Rural Minor Softball Association. Under the leadership of Head Coach Chris Bishop, this team has spent a remarkable amount of time giving back to the community. This group of players and their families have conducted several food drives and raised over 5,000 lbs. of food and over $1,600 in cash donations. The team developed Baseball Day to recognize the game in this region. This a fun day of fundamental training, featuring Rep and Select games and a BBQ. The collected used baseball equipment and sent it to less fortunate countries. The Academy provides opportunities for the youth to excel and make positive changes in their lives as per WRBA's Mission Statement, “To promote positive and healthy lifestyles for the youth in our community." WRBA has hosted an after-school program, a seniors' fitness program and a high school credit recovery program in addition to recreational and competitive boxing programs. An alumnus, Lennox Lewis, won an Olympic Gold Medal and is retired Heavy Weight Champion of the world. Other graduates include other Olympians (such as current Canadian (11-time) Champion Mandy Bujold) and champions at various competitive levels. WRBA holds an annual fundraiser (Beatings) in support of the Children’s Wish Foundation. Congratulations -- well done! The awards were presented at the Athlete of the Year Dinner held May 16, 2017 at Golf's Steakhouse in Kitchener.